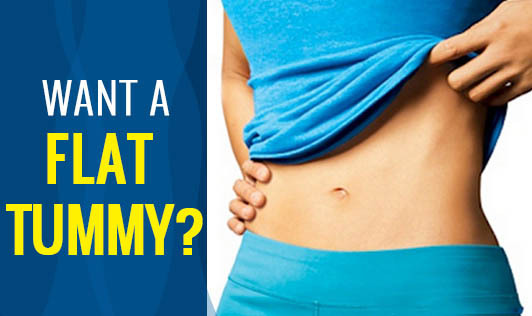 Whether it's a sign of health or beauty status, a flat stomach is something that many people crave for. While you cannot reduce all the body fat accumulated, you can lose belly fat by decreasing your total body fat percentage. Mind your Posture: If you slouch, the stomach pooches. So, align your body in position while standing, sitting and walking. Strengthen your shoulders and straighten your back. Your energy level improves when you have good posture. Without doing any abdominal exercise, you can look much leaner by minding your posture thereby giving you a better appearance. Cut Calories: The abdomen is a place where fat tends to accumulate. The kind of food you eat is vital to bring in any change. Foods like fruits, vegetables, whole grain breads, lean cuts of chicken, meat, fish and low fat dairy products should replace processed foods, salts and sugars. Cut just 500 kcal from your diet everyday to shed 1- 1.5 kg a week. This is as easy as replacing sodas and diet colas with water, and junk food with healthy snack options. Check with your Dietitian to guide you on the diet! Strengthen Your Abdominal Muscles: You can't spot-reduce belly fat by just doing crunches and sit-ups. Spend just 10 to 20 minutes on your workout that involves the whole body, and some abdominal exercises to define those muscles. Get a physical trainer's advice to have personalized workouts! Practice Yoga: Practicing yoga increases the flexibility of the body and paves way to strengthen your abdominal abs along with other workouts. Get More Sleep: If you are unable to sleep 6-8 hours every night, you might be at a higher risk for obesity and accumulation of extra abdominal fat. Lack of sleep can interfere with your appetite-regulating hormones and you may begin to crave for more sweet and salty snacks. This can trigger the levels of cortisol, and appetite inducing hormones associated with belly fat. Keep Cool: Stress and anxiety tend to trigger the over-production of the hormone cortisol, which encourages weight gain. So, steal those few minutes to relax each day to find the difference in you! You might experience setbacks, roadblocks and frustration along the way. But, remember that rewards always come with time, dedication and consistency!